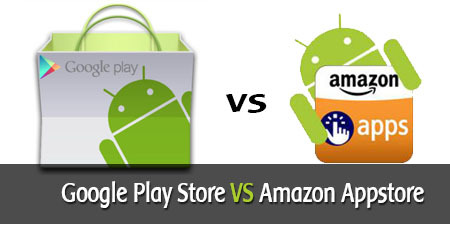 Homepage » Android » Google Play Store vs Amazon Appstore – Which is Better? Android is an awesome operating system and there’s no denying it. More than half of the smartphones around the world run on Android operating system and that’s an enough reason to see how popular Android OS is. Android comes with Google play store as the default play store from where you can download apps and games on your smartphone, but that’s not the only store you can use to install apps. Android allows third-party stores too from where you can get your favorite apps installed on your smartphone. One of the best app store to be considered is Amazon Appstore. At first, Amazon Appstore was available only in the US, but now it is available in over 200 countries. The Amazon Appstore for Android is one of the biggest competitors for Google Play store and it contains thousands of apps and games for Android smartphones and tablets. So let’s see which app store is better than the other. We all know that Google Play Store comes pre-installed in every Android smartphone so there is no worries of installing it from outside source. But to install Amazon Appstore for Android, you need to download the APK file for the store separately and then install it on your smartphone. Also you need to have an Amazon account in order to access the app store. At present, there are still some devices that don’t support the Amazon Appstore and that can be considered as a major drawback. Google Play Store gets updated regularly by the developers to stay strong in the market. Android has been available for the mobile phones for over 5 years and the Play store has also been updated regularly to give the best user experience. Each and every app and game in the Google Play Store has its separate web page with all the details like the features, ratings, user reviews and other data for the app. Google Play Store has everything sorted out and you can search for an app easily. On the other hand, Amazon Appstore does offer a good interface but it lacks the user friendliness. You can’t search for any particular app in the Amazon Appstore, but they are sorted out as ‘Top Paid’ and ‘Top Free’ apps. This one is a simple one as Google Play Store consists of over a million applications to download from where as Amazon Appstore hasn’t even reached up to 100K mark. Any new application launched for Android first appears in the Google Play Store and only after that it reaches to other marketplaces, so it is understood that Play Store contains a lot more apps than other stores. One point to note here is that all the apps in the Amazon Appstore is organized by Amazon itself, so that can be another reason for the less number of available apps in the store. Google Play Store doesn’t offer any kind of deals or offers on the apps and games. But with Amazon Appstore, you can get some deals on the available applications in the store. One of the best things about Amazon Appstore is that it gives the opportunity to download one paid app for free to its users everyday. If you are spending money on buying the applications and games from the apps store, you might want to know if you can get the money back if you don’t like the app. Google Play Store does give you a chance to get back the money you paid for your app. You can get the money back within 15 minutes of the purchase. However there is no such thing or Return policy offered by Amazon Appstore as of now. It’s clear that Google Play Store is the winner in this showdown and Amazon Appstore, though a really good alternative, doesn’t offer much features as Google Play Store. Google Play Store comes pre-installed and you need Gmail account to get started with it and the complete procedure is extremely simple. On the other hand, things are not so smooth with Amazon Appstore as it is not easy to set up, the number of applications in the store is less and there is no return policy offered to the users. The winner here is Google Play Store but if you are facing any troubles using it, then the best store to go with would be Amazon Appstore. So let us know what you think about Google Play Store vs Amazon Appstore and which one, according to you, is the best one!